Condensin belong to Structural Maintenance Complex (SMC) protein family that are involved in chromosome organization. The key feature of these SMC protein complexes is the ring-shaped structure consisting of 3 major components – two structural maintenance complex (SMC) subunits and one kleisin that together form a ring, as well as 1 or 2 vital co-factors. Through a mechanism where the SMC protein embraces the DNA, condensin condenses DNA using ATP as an energy source, related to the DNA loop extrusion function that was recently discovered . Here, we will show that single-condensin is sufficient for a single DNA loop extrusion using dry-AFM imaging, and there are at least two DNA binding sites in condensin. In addition, resolving dynamic conformational changes of the SMC complexes is key to resolve the mechanism underlying these important functionalities . High-speed atomic force microscopy (HS-AFM) is uniquely fit to address this question since it allows video-imaging of entire protein structure with high spatial resolution (~1 nm) as well as high temporal resolution (50 ms). Here, we will show HS-AFM video imaging of condensin  in physiological buffers. Conformational changes of SMC dimers of condensin are directly imaged for various conditions. The real-time imaging reveals how structures of these protein complexes evolve over time, from which the structure-function relationship of condensin can be obtained. These results provide insights into the molecular mechanism of condensin-mediated DNA loop extrusion. 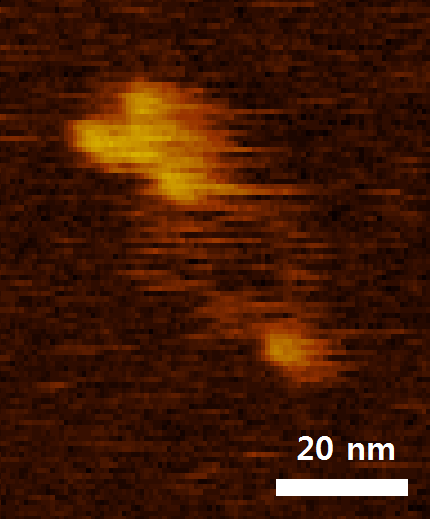 HS AFM image of condensin with all subunits.